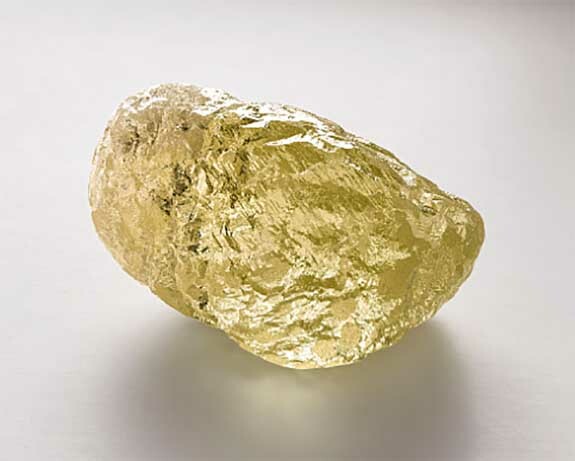 Last October, in Canada’s frozen Northwest Territories, just 135 miles south of the Arctic Circle, the Diavik mine unexpectedly yielded a 552-carat fancy yellow diamond. It is the largest of its kind ever discovered in North America. Canadian mines are known to produce high-quality diamonds but not particularly large ones, making this finding quite remarkable. Despite its impressive dimensions, the Canadamark™ diamond rates only 25th on the all-time list of the world’s largest rough diamonds, just ahead of the Lesotho’s Letseng Star (550 carats) and just behind the Central African Republic’s Spirit of de Grisogono (587 carats). The top seven diamonds on the list are all from the continent of Africa, including the granddaddy of them all, the 3,106-carat Cullinan, which was discovered near Pretoria, South Africa, in 1905. 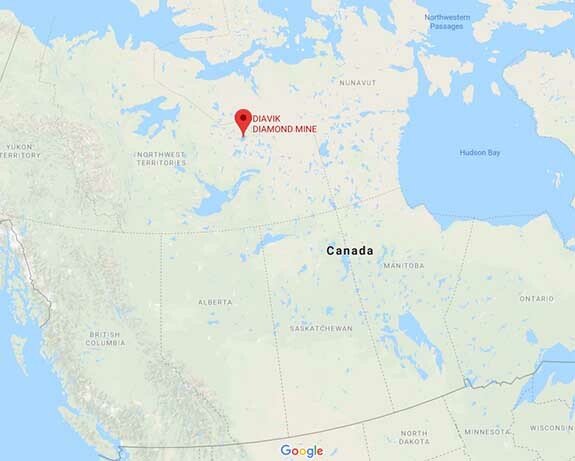 Due to the historic nature of the stone, Dominion Diamond Mines, which owns 40% of Diavik, reported that it will be selecting a partner to cut and polish it. The task is so risky and complex that only a handful of master cutters are capable of handling the assignment. Dominion expects to achieve a “significant” main stone once the diamond is polished. Previously, Dominion Chief Executive Officer Shane Durgin told Bloomberg.com that it was miraculous that the diamond survived the mining process, which entails passing diamond-bearing ore through crushing machines. 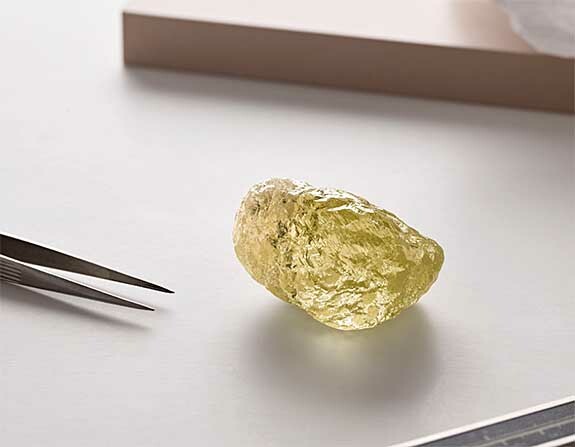 The 552.74-carat stone was uncovered during the initial screening process at Diavik’s recovery plant and abrasion markings on the stone’s surface attest to the difficult journey it underwent during recovery. Credits: Diamond images courtesy of Dominion Diamond Mines. Video footage Fox5NY.com. Map by Google. Emerald Ring That Survived the Sinking of the Titanic Is Featured on BBC’s ‘Antiques Roadshow’Gifts for your Valentine – Love Simply Stated! Shop early for best selection.